Western bean cutworm trap catches continue trickle in this week with more reports of empty traps. Many of the traps have been removed this week with the low catches. There are reports of damage to field corn in Northern NY. 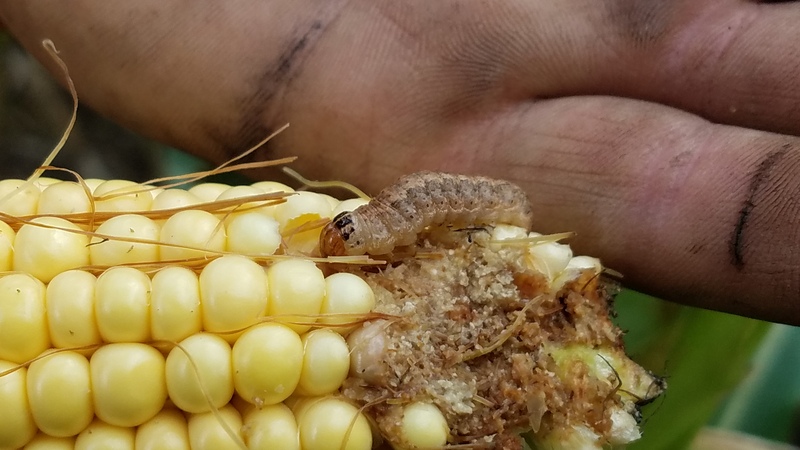 Once the larvae have entered the ear of corn insecticides are not effective at controlling the pest. The data is presented below. There are reports of minor infections of certain corn diseases. While it has been wet diseases are not been a big issues yet this season. Many have reported low levels of northern corn leaf blight, northern corn leaf spot, eyespot and gray leaf spot. Many grower have avoided spraying for diseases this year because of the low incidence of corn diseases. Scouting fields for the presence of disease is very important in making an educated decision on spraying a fungicide or not. Report of soybean aphid population have declined. Once a field excessed the R5 stage of growth aphids cannot really hurt yield. The 250 aphids/plant threshold is for plant growths stages R1 to R5. Last week temperatures were near normal to 4 degrees above-normal. Precipitation has ranged from less than ½ “ to over 3”. Base 50 growing degree-days ranged from 100-180. There were improvements in drought conditions in western NY and northern NY. Dry weather into the weekend, increasing temperatures and humidity through next week. Today temperatures will be in the upper 60s and 70s with lower humidity. It will be a mostly dry day with a few isolated showers. Overnight lows will be in the 50s to near 60, some 40s are possible. Friday will be in the 70s and low 80s, pleasant and dry. Overnight temperatures will be in the 50s to near 60. Saturday temperatures will be in the upper 60s to lower 80s, with a chance for evening shower and thunderstorms. Overnight temperatures will be in the upper 50s to mid 60s. Sunday highs will be in the mid 70s to mid 80s with scattered afternoon thunderstorms possible. Overnight temperatures will be in the upper 50s to mid 60s. Monday temperatures will be in the mid 70s to low 90s with increasing humidity and a chance of showers. Overnight temperatures will be in the upper 50s to near 70. Tuesday highs will be in the upper 70s to low 90s with continued muggy conditions and a chance of showers. Overnight temperatures will be in the mid 60s to low 70s. Wednesday highs will be in the upper 70s to low 90s with continued muggy conditions and a chance of showers. Overnight temperatures will be in the mid 60s to near 70. The seven-day precipitation amounts will range from a trace to three quarters of an inch. The 8-14 day outlook (Aug 30 – Sept 5) favors above-normal temperatures for all of the state and slightly favors above-normal precipitation for the western half of the state. 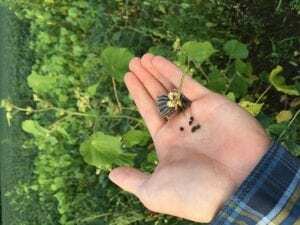 What’s the deal with velvetleaf this year? Velvetleaf has been a bigger problem this year. Why? A couple thoughts: Velvetleaf has large seeds. Large seeds have the energy to emerge from several inches down. Therefore, if pre-emergence herbicides did not get enough rainfall (like in the dry part of early summer this year), they could emerge through the chemical barrier. Post-emergence herbicides are most effective on velvetleaf when they have 4-leaves or less, because older plants have velvety, drooping leaves that reduce uptake. This would be an even bigger concern for contact herbicides, like glufosinate. Also, velvetleaf has prolonged emergence. So multiple control efforts may be necessary. I haven’t been seeing velvetleaf dominate entire fields. It’s more in patches where the crop stand isn’t very good. This indicates to me that the early-season controls may have been successful and then the crop was able to smother later-emerging velvetleaf. But where there were low stand counts, these stragglers were able to take hold. As we enter the harvest season take some time to update your field records. It is a great time to take stock of what field issues can be found and note them in individual field records to enhance future management decisions. Note particularly good and bad areas with the field such as differences in crop height, plant populations, drainage, yield, etc. Updates on pest presence or damage can also be noted at this time. An easily visible pest group to document this time of year are weeds. What species? Where are they found? How many are there? What management type (annual, perennial, biennial, grass or broadleaf species? Knowing this information helps to refine weed management decisions and develop next years cropping plans. While visiting fields to conduct the fall weed survey note presence of troublesome perennial species like Canada thistle and milkweed and potentially invasive species such as spiderwort, Japanese knotweed, leafy spurge, multiflora rose and spotted knapweed growing in or around production and fallow fields, pastures, in fence lines or in windbreaks. Consider hand weeding or spot treatments if practical. Many websites have information on invasive plant species. For information on invasive species in NYS see: http://nyis.info/ and http://www.invasivespeciesinfo.gov/plants/main.shtml. Planting Winter Small Grains? What are the Pest Issues? Growing cereal grains is on the increase across New York. Many of the winter grains are about to be planted. Many producers are planting small grain cover crops this fall. Some will be planting winter wheat, winter rye, winter triticale and winter malting barley for grain and straw. Sometimes we forget that there are several diseases and insect pest issues with planting winter small grains. Here is a list of items to consider when planting. Do not plant cereal grains in the same field that had previously been a small grain. Rotation helps control many diseases like: scald, powdery mildew, Stagonospora nodorum blotch, glume blotch and more. Select a cultivar that is adapted for your region. Remember to select one that has resistant to many of the diseases in the area. The diseases you want to think wheat spindle streak mosaic virus, soil borne mosaic virus, barley yellow dwarf virus, powdery mildew, leaf & stem rust, spot blotch, net blotch and more. Follow the Hessian Fly Free Date: Make all small grains (cover crop or grain) are planted AFTER the Hessian Fly Free Date! Why? Hessian fly is a pest of small grains. The Hessian Fly Free Date is the point that Hessian fly is not active in the fall. The Hessian Fly Free Date indicates when aphids will not be active in the fields. Aphids alone are not a problem but they can transmit barley yellow dwarf disease to the plants. ALWAYS use certified seed when planting. Certified seed is free from weeds and other diseases. If planting conventional small grains it is important to use a fungicide on the seed at planting. This will help protect from soil borne fungal diseases. Good integrated crop management is also important. Soil health, fertility, tillage practices, proper seed bed preparation, planting depth make for a healthy plant that can withstand more pest pressure. *Monitor potato leafhopper, foliar, systemic and crown rot diseases. * Prepare for planting winter small grains after the Hessian Fly Free Date. *Monitor for mid-season corn pests including European corn borer, corn rootworm, western bean cutworm, slugs, foliar diseases such as northern corn leaf blight and gray leaf spot, weed issues, nutrient deficiencies, vertebrate damage. *Consider purchase and release of Muscidifurax raptor and/or M. raptorellus natural enemies of house and stable fly pupae.